When you want to buy a new vehicle, you need to talk to some of the best dealers in town. At Suburban INFINITI of Novi, we have the salespeople who can match you up with a great new vehicle. We also have a wide selection of new vehicles, including sedans, coupes, crossovers, and SUVs. But our inventory is always changing, so you should check in with us so that we can look out for the best vehicle for you. Many people have difficulty deciding if they want a new vehicle or a used one. While there are plenty of upsides to buying a used vehicle, such as a lower monthly payment, there are plenty of reasons to buy a new vehicle. And you should be open to finding the vehicle that will work for you and your lifestyle. One of the biggest benefits of owning a new vehicle is that you know that it’s straight off the line. This means that you’ll be getting a car that will be hassle-free for at least the first few years. You also have the luxury of breaking in the vehicle the way that you want to. When you buy a used vehicle, you never know what someone else did with it. How would you know if they had all of the regular maintenance done on it? You’ll also like that a new vehicle is completely free of any exterior damage, so there won’t be that one scratch on the side of the driver’s door that you notice every time that you get in your car. The inside will be exceptionally clean, as well. And don’t forget about that new car smell that so many people love. You’ll also appreciate when the vehicle comes with a warranty that’s good for a couple of years. Also, although a used car costs less, new cars often come with better finance rates. And if you’re choosy about the vehicle that you drive, you’ll like that you can customize your vehicle when you buy a new one. If you want a certain model that has a particular paint color and interior fabric with a leather-wrapped steering wheel, if the manufacturer makes it, you can get it. You also don’t have to look through several or even a dozen cars that don’t come close to fitting the vehicle that you’re looking for, and doing research on a new vehicle is a piece of cake. Finally, some people really want all of the new features, such as safety and technology features, and with a new car, you can get it. At Suburban INFINITI of Novi, you can feel confident that you’re getting a high-quality vehicle because that’s all we sell. Every car, SUV, and other types of vehicle is inspected when it comes off of the line at the manufacturing plant. And we have knowledgeable people on staff to ensure that you’re matched up with the right quality vehicle. 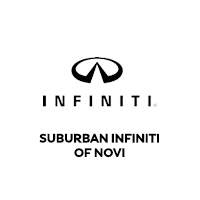 If you’re looking for a new vehicle, check out our selection at Suburban INFINITI of Novi. One of our experienced sales associates will help you find the exact vehicle that you’re looking for.